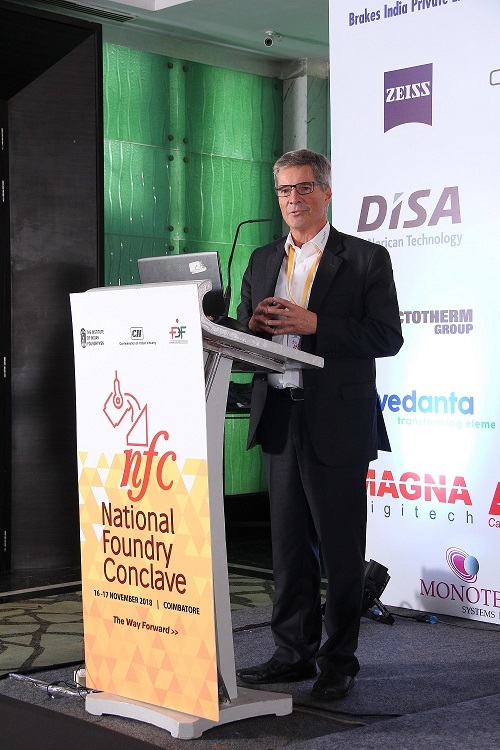 At the end of November the ninth National Foundry Conclave took place in Coimbatore. Johannes Schröder from Plansee Composite Materials presented the advantages of Plansee tungsten alloys in the aluminium foundry. In his lecture "Densimet® - The Way Forward in Aluminium Die Casting Industry" Johannes Schröder presented the advantages of Plansee's tungsten alloy. The material exhibits several essential properties, which give crucial advantage to optimize the temperature management in molds: outstanding thermal conductivity, excellent corrosion resistance against aggressive Al-melt and low thermal expansion. Consequently, a longer lifetime of the molds, decreased cycle times, no heat checking and soldering, reduced scrap rates and enhanced quality of the cast part finally increase the productivity of the casting process in Al-foundries. The National Foundry Conclave is an event started by Confederation of Indian Industry (CII) in association with Institue of Indian Foundrymen (IIF) in 2002. The forum is held exclusively for the top management of the Foundry Industry, with an opportunity to come together every two years to get an exposure of the best practices, innovation, exchange of ideas, sharing of experiences, and address on technological and social concerns of the foundry industry.